Indeed, it seems like you can literally see the transition as you read through the issues collected here, as the chapters are handled by different and distinct artists. 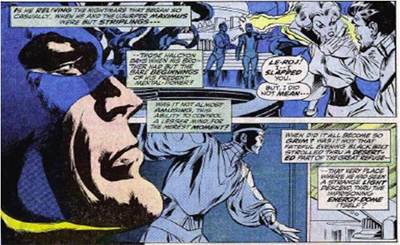 The earliest entries in the adventure are penciled by Sal Buscema, a classic comic book artist whose work here evokes the emotive stylised art of Jack Kirby. 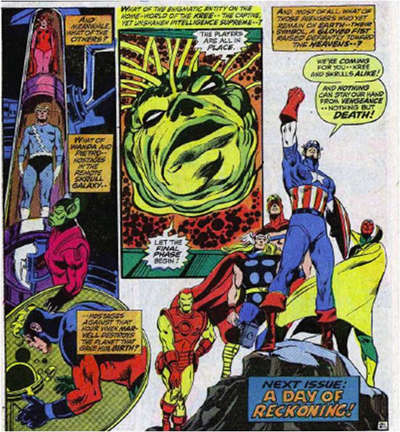 These opening issues feature all manner of wide eyes and gaping mouths, very much in the style of sixties Marvel, calling to mind the most influential of Marvel’s early artists. There’s something remarkably classical in those early issues, something that distinctly feels like an older comic book. And then something changes. Neal Adams arrives. Adams is one of my favourite comic book artists, I freely admit. Even if his modern stuff isn’t quite as strong, I still treasure his work on titles like Green Lantern and Batman. It has frequently been said that Adams illustrates superheroes as they really would exist – I’m not quite sure that’s accurate, as Adams’ heroes are far more graceful and stylish than any real person in a silly spandex outfit. However, I would suggest that Adams draws characters who reflect real anatomy in a manner distinct from earlier more stylised work – Adams draws Olympians, with muscles that look poised to strike, while earlier artists favoured expressive exaggeration. It’s telling that Adams and Thomas would also collaborate on X-Men, writing the most celebrated work before the series was abandoned for reprints (and before Chris Claremont arrived to salvage it as Uncanny X-Men). Adams has a distinctly cinematic style, as illustrated in one rather wonderful sequence where he juxtaposes two simultaneous action sequences against a ticking clock. It feels perhaps a bit more urgent and dynamic than earlier work, and the artwork could conceivably have been drawn last week. I think that’s at least part of the reason that Kree/Skrull War has endured as a classic, but it’s also because Thomas and Adams seem to be made for one another. I keep rememberin’ when I was a runt back at the orphanage. That’s when I first found a barrel full’a old comic books. I read ’em and re-read ’em, till they were falling apart! Let’s face it, fella — the world ain’t like that anymore. If it ever really was. These days you can’t tell the good guys from the bad guys without a scorecard — and there ain’t no scorecard! It’s interesting how Thomas seems to re-frameThe Avengers within the wider context of the Marvel Universe. A lot of the early appeal of Marvel, especially in contrast to DC, was the idea that their heroes were outsiders and somewhat counter-establishment. Spider-Man was a bullied kid. The Hulk was a rage monster. The X-Men protected a world that feared and hated them. In many ways, it seems like Thomas is foreshadowing a lot of the darkness that would be explored in the decades ahead. 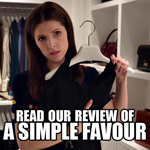 For example, Thomas suggest that the superheroes exist on a very thin allowance of public trust and confidence – that the weight of public opinion is waiting to be turned against them on a whim. It’s no coincidence that the words “Avengers Dis-Assemble” appear on a placard waved outside the group’s headquarters. Undoubtedly unintentionally, Thomas seems to hint at stories to come. 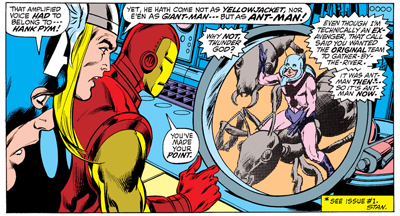 Hank Pym violently strikes Janet here, years before he’d repeat the action in a much more sinister manner. Here Thomas pitches as a slightly more sinister twist on the classic Silver Age cliché that it’ll all be explained later. “Sorry, honey,” he remarks after giving her a smack across the face, “no time to explain — but this is the way it’s gotta be!”It comes across far more sinister now than it ever seemed back in the day, given much more resonance than it might originally have carried. I don’t think Thomas intended to suggest a plot that had yet to form as even an idea, but I do think it’s an interesting coincidence. 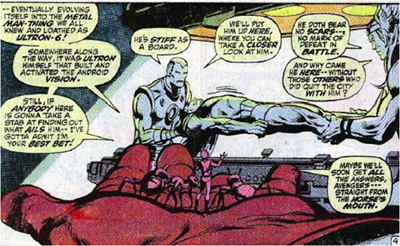 Similarly, we have the idea that Tony Stark might be conspiring against his team mates. 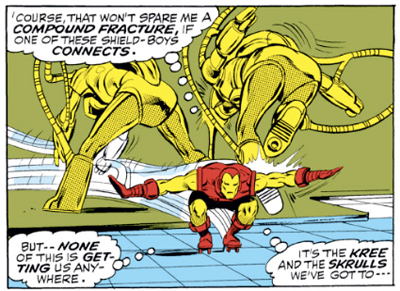 The suggestion that Tony Stark built the Mandroids and specifically trained them to deal with the Avengers suggests a whole slew of future plotlines. The character hadn’t yet been truly defined as pragmatic futurist willing to do whatever he needed to for the greater good, but his lines seem much more sinister than probably intended. “And,” Iron Man boasts, “in simulated battle, the men inside ’em were trained to take on even — the Avengers!” If I were Iron Man’s team mate, I would wonder why his ’employer’ (since his identity was secret) was using me as a training exercise. Thomas even suggests that the Avengers themselves might buckle under public scrutiny. The HUAC hearings were still fresh scars on the American psyche, but it’s interesting to see Thomas apply the same “witch-hunt” to superheroes. There’s just a hint of early deconstruction about this story, as Thomas picks quietly at an unspoken rule in comics. The public aren’t relieved that they’ve been saved, they’re terrified that they were ever threatened. 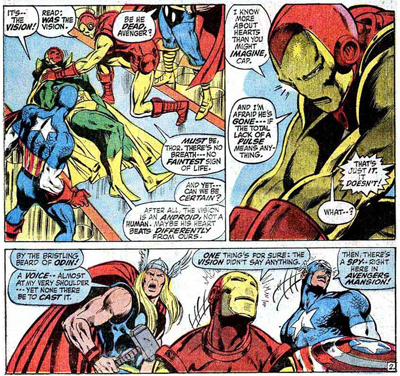 The survivors of one Avengers issue break an unspoken rule of the genre and talk to the press, and the media seem to want to hold our heroes to account. “But,” the Vision protests almost offended, “I thought they understood the need to remain silent…” Indeed, after the fact, we’re even explicitly told they were sworn to secrecy – they didn’t just break an unspoken rule, but an honest-to-goodness oath. It’s interesting that Thomas would explore this aspect of the relationship between power and accountability before the Watergate scandal broke, the event that would lead an entire nation to question their elected officials. In a way, as Thomas portrays a public increasingly uncertain about the Avengers, he seems ahead of the curve. In fairness to Thomas, his story straddles the line between the optimistic Silver Age and more cynical Bronze Age. It turns out that this public dissatisfaction with the superheroes is actually the result of an alien conspiracy involving a shape-shifting Super-Skrull and a telepathic Supreme Intelligence. The public aren’t really out for the team’s blood, it’s just a wacky bad guy plot, in the end. However, Thomas does suggest it could easily happen. 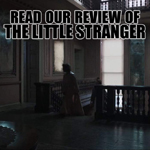 While he doesn’t play the drama out to its rather depressing conclusion, he at least heavily foreshadows many of the difficulties that would face Marvel’s superheroes in the decade to come, as they struggled to reconcile their power with pragmatic realities. 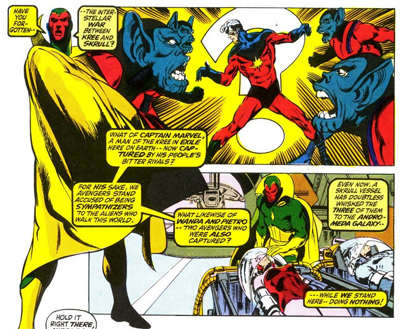 The Kree/Skrull War works so well because it balances almost perfectly the demands of the older innocent stories and the more grounded adventures that would follow. 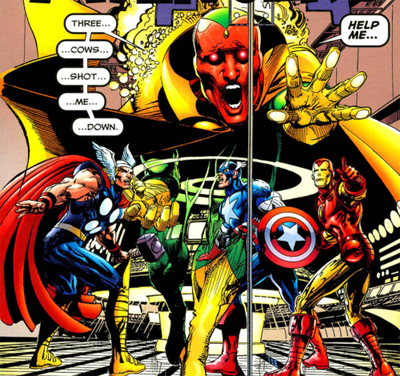 An early issues sees the team attacked by Ronan the Accuser. 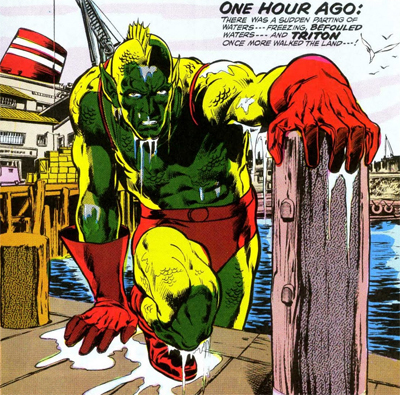 In many ways, the character is a typical Silver Age villain. Once he captures Mar-Vell, he starts monologuing and doesn’t seem to want to stop. 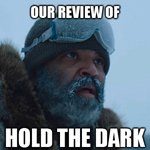 He has a “de-evolution beam” that seems to create cave men and woolly mammoths out of nowhere – even in what looks to be a fairly tropical climate. Ronan is prone to shouting and bouts of melodrama while he explains his evil plan. However, his plan is grounded in realpolitick. He isn’t some lone fool who wants to destroy or conquer the world because that’s what supervillains do. The heroes aren’t even his primary concern. “A planet which can produce such a race — which can go from steam power to atomic power in less than a century — is a potential threat to Kree supremacy in space — a threat which cannot be allowed to grow and fester,” he explains. 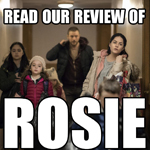 Ronan’s plan is built around the idea literally devolving the planet – enforcing a stone age on a “backwash world” only of strategic value in a wider conflict. “Beachhead Earth.”Earth isn’t the target in and of itself, it’s just stuck in the middle of a bigger conflict – it’s like one of the smaller satellite states during the Cold War. That’s not to suggest that mainstream comics had been apolitical before. After all, Superman had been introduced into the pages of Action Comics as something of a socialist radical, tackling inequality and exploitation. While some element of that politic subtext remained into the Silver Age, I think it’s fair to say that the superhero politics of the day had been more conservative and Amero-centric, and certainly more simplistic. Stan Lee and Jack Kirby channelled fifties atomic paranoia into The Incredible Hulk, but never courted controversy. While retroactively used to characterise Tony Stark as morally ambiguous, his origins fighting Communists were originally presented as earnest geo-political commentary and simplistic heroism. (That retroactively changed when the opinion of those wars changed.) While Stan Lee would erase the excesses of the “Commie-Smasher”phase of Captain America’s history, characters like Iron Man and Thor would frequently battle Cold War spies, fighting for American values and ideals. And so The Kree-Skrull War seems somewhat more mature than all that, playing out the Cold War from a vantage point unfamiliar to most Americans, with Earth itself as nothing but a chess piece in a game played by two super-powers. There is a cynicism and skepticism here, a questioning of moral authority and values, that seems quite potent. The Avengers can’t trust the government. The people can’t trust The Avengers. The Vision can’t even trust Captain America. Only Rick’s childish imagination can save the universe! Morrison would be so proud. Cleverly, Rick manages to save the universe in a comic book by using characters he remembers from a comic book. “You mean — the ones I usedta read about in those old comic-mags I found at the orphanage?” he asks. While the Vision also has a very clear arc over these issues, Rick Jones is the focal point of The Kree-Skrull War, and Thomas wisely focuses on the importance of Rick’s humanity. I think that Thomas also deserves a massive amount of credit for the way he constructed the story. 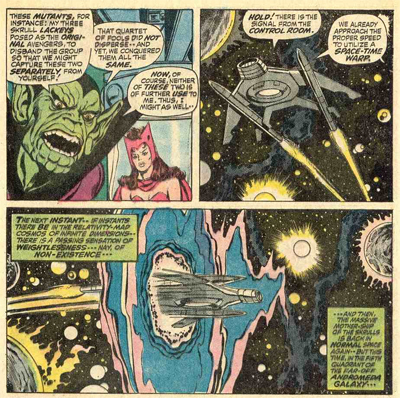 I know that the shared Marvel Universe existed since the very beginning, with heroes and villains overlapping, but The Kree-Skrull War feels like an important step towards a cohesive shared mythology. The story cobbles together countless separate strands of continuity from loads of different series and blends them into one shared whole. While Spider-Man had tried to join the Fantastic Four, or the X-Men and Magneto had tangled with Namor, or Quicksilver and the Scarlet Witch had migrated to the Avengers from the X-Men, I think that Thomas was doing something considerably larger, and something that had untold influence on the stories that followed. Of course, the flipside is that some of it is quite clumsy. There’s a lot of continuity here, although Thomas and his artists are careful to explain everything that the reader needs to know within the pages of the book. This does tend to slow down Thomas’ narrative a bit, and to make some chapters just a little too heavy on exposition, but it’s fascinating to watch Thomas stitch these different strands together. 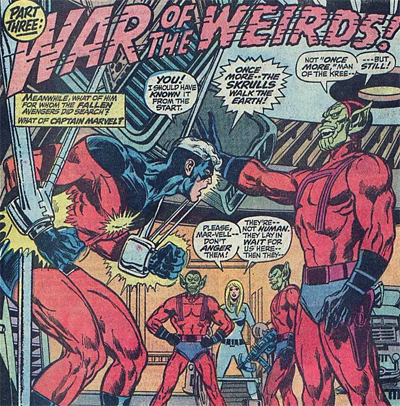 The Kree/Skrull War is a genuine Avengers classic. If you are willing to look at an older comic book, I am hard pressed to think of a better choice from this era. 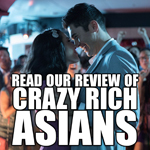 Another great review! This one is on my Amazon wish list! Considering you didn’t really warm up to Stan Lee’s run on The Avengers (I rather liked it, but didn’t necessarily love it), perhaps you’d enjoy Roy Thomas’ complete run (starting at issue 35)? I don’t know. 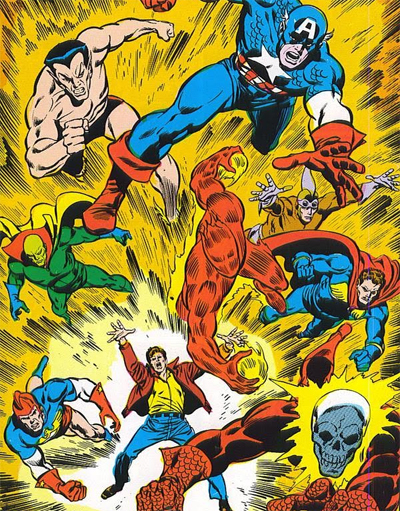 I’ve waded in and out of bits and pieces of classic Avengers via comixology. And I’ve yet to find something that grabbed me like the best runs of the time period. Every time it seems like they’re gathering momentum, they seem to get caught up in some procedural debate or by-laws argument or basically complain about the government pointing out that they should probably be a little accountable, what with all the former criminals and terrorists on the team. It’s kinda like if the X-Men complained about being a victimised minority without being a victimised minority in any tangible way. What do you mean about the X-Men connection? What are the Avengers complaining about again? 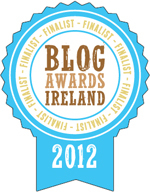 Sorry, should ahve been clearer. 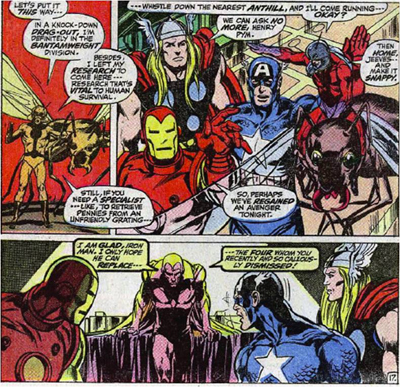 In the classic Avengers comics, the Avengers live in a mansion with a butler and organise a team of superhumans that typically include honest-to-goodness criminals (Hank Pym, Hawkeye, Bruce Banner) and terrorists (Quicksilver, the Scarlet Witch). However, there’s a tendency to portray attempts by the democratically-elected government of the United States to monitor and supervise the team as unreasonable and borderline villainous. There are (of course) understandable objections to government oversight of a team of sentient super-weapons, but the comics never really play with that idea. 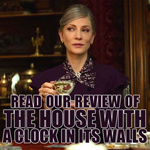 Instead, the fact that people are uncomfortable with a bunch of super-powered individuals hanging out together in their mansion with their butler is played for all sorts of trademark Marvel angst. That angst works very well for characters like Spider-Man or the X-Men, because those are people who actually are oppressed and victimised and bullied. The X-Men band together because they are genuinely afraid of lynch mobs and racially-motivated violence. In contrast, The Avengers stick together because they like hanging out together, and refuse to acknowledge that maybe that much power living so opulantly should unsettle the public. Thanks Kesher! 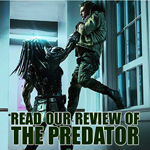 I try to make the reviews stand out a bit, particularly for older material that has been well (and in many cases thoroughly) been covered by other writers.